For those of you who are unaware, FurAffinity has recently updated its Code of Conduct, specifically section 2.7, regarding its policy on hate groups. Whilst the website has always had a firm stance regarding extremist political ideologies, the changes to section 2.7 are representative of an increasingly polarised political climate, a paradigm shift towards intolerance of opinion, and an emphasis on difference only manifested in the material plane. This is a threat to everyone, irrespective of political alignment. Fred McFeely Rogers, best known as the host of Mister Rogers’ Neighbourhood, carried with him a quote from one of his professors, Dr William Orr: ‘There is one thing evil cannot stand, and that is forgiveness.’ Forgiveness, much like tolerance, is dependant on the concept of acceptance, although the difference between the two is that forgiveness carries with it a prerequisite that a perceived wrong-doing must be later rejected by the party held responsible for the misdeed in the first place. However, both forgiveness and tolerance both share a mutual and highly important anti-thesis: belligerence. Belligerence, as defined by Merriam-Webster, is an aggressive or truculent attitude, atmosphere or disposition. The hostility brought about with belligerence creates a warlike mentality, and is at the epicentre of every human-inflicted tragedy in history, whether it be the savagery of numerous revolutions (one native in every 10 died during the revolutions in Russia (1905-39), China (1949-76) and Mexico (1910-34)), the extermination of around 25% of the population of Cambodia under the Khmer Rogue, the perpetual attacks committed against the west and its civilians by Wahhabi terrorists, or perhaps the most infamous example, the extermination of 6 million Jews during the Holocaust. But it is not only belligerence that these tragedies all have in common. They also share amongst them a mortifying torrent of political extremism as the justifications for these tragedies. They decree that the colossal loss of life is permissible for reasons most rational human beings would find both moronic and abhorrent in equal measure. But despite the criticisms these justifications may receive, their existence serves as a paper-thin shield to excuse the individuals responsible, as a means to avoid introspection and to continue their unapologetic pursuit to their fanatical end-game. The horrors aforementioned are completely antithetical to the ideals of tolerance and forgiveness. But let’s scale right back to the start of this article, being the rule changes on FurAffinity. This is how Section 2.7 looked before the change. (Current Rule) Code of Conduct, Section 2.7 – Do not identify with or promote hate groups and their ideologies. A hate group is one that advocates and practices hatred, hostility, or violence towards members of a designated sector of society (e.g. Nazism, KKK, ISIS). Symbols specifically associated with these groups will not be permitted in user avatars, non-fictional content, or content intended solely to disrupt the community. Users who identify with or promote hate groups and their ideologies may be permanently banned from Fur Affinity without warning. And this is how it looked after. The big take-away is that amongst the established hate groups, such as the Nazis, the KKK and ISIS, the term “alt-right” has been included as a prohibited group or ideology. The official update posted by the Fender account on FurAffinity also cites “alt-furry” groups as being prohibited, although this is not explicitly stated in the updated code of conduct. This should be alarming to everyone who takes a universal stance against belligerence, regardless of political convictions, and in this post, I aspire to detail why this is the case. Generally, the term “alt-right” strikes a certain level of disgust and fear in those who do not identify or sympathise with the movement, whether they be liberal, libertarian, socialist, centrist or even conservative, and in many respects, this is completely understandable. The mainstream perspective details the alt-right movement as being a highly bigoted and prejudiced group, responsible for several terrorist attacks in the United States, in the name of their ideology. Whilst this is partly correct, there exists a plethora of false information on the alt-right, often spread by those unaware of what the movement actually is, or, more sinisterly, in an effort to spark hostility and a witch-hunt mentality towards targets designated by certain bad faith actors. This is extremely harmful not only to political discourse, which is increasingly regressing in quality, but to our perceptions of others. The 2016 presidential election in the United States alone divided a nation, broke apart friendships and even families, and left basic political civility in ruin. The alt-right themselves are hardly innocent in this regard either, resorting to political militancy themselves, further stoking the flames upon decency’s carcass. But where do you turn when the realities of politics are bringing you down? Some turn to music, film, television and video games. Others participate in physical activity. And some turn to communities of like-minded individuals, which is where the furry fandom comes in. Unfortunately, many of these communities have been overrun by the same political divisions facing western society as a whole, and the furry fandom is no exception to this. However, the politicisation of the community reached boiling point in January 2017, when a furry known as Deo Vacuus claimed that she couldn’t “wait to punch these Nazis”, in reference to a group known as the Furry Raiders, a controversial, albeit apolitical sub-community within the fandom, who aspired to attend the Rocky Mountain Fur Con in Denver, Colorado. 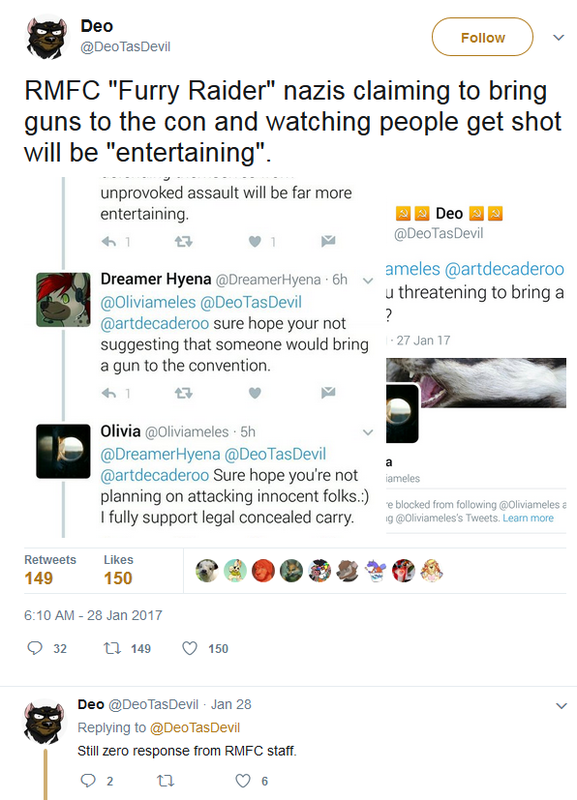 When @Oliviameles, a Twitter account with hereby unknown political affiliation responded that “watching you get shot by someone defending themselves from unprovoked assault will be far more entertaining”, Deo responded by claiming she was threatened by Olivia, despite the fact that Deo actively announced her intentions to physically harm others on political grounds, whereas Olivia never even stated she was attending RMFC, let alone stating she would be the one to harm Deo in retaliation. This does not make Olivia’s tweet entirely innocuous, but it greatly distills Deo’s claims of being threatened. Because of Deo’s call to violence, Denver Police were contacted, and concluded that the threats of violence were credible, thus requiring the organisers of RMFC to hire professional security to the sum of $22,000 if the event was to proceed, a sum RMFC could not afford. This ultimately lead to the cancellation of the convention in April 2017. Things have not gotten better over the past year and a half, and the recent changes to the FurAffinity code of conduct is deeply endemic of this. The revised Section 2.7 fails to account that there is no universally agreed upon definition as to what constitutes whether something or someone is alt-right or not. Whilst the previous groups termed by Section 2.7 (Nazis, KKK and ISIS) are often used to label others subjectively and incorrectly, the participation of certain individuals in those clearly-defined groups can be used to make an objective statement regarding one’s political leanings if handled prudently. On the other hand, there appears to be some disparity as to whether the alt-right is a group or an ideology, and the political beliefs that they all have in common. This has lead to American nationalists like Donald Trump, traditional conservatives such as Ben Shapiro, and even Carl Benjamin, a classical liberal, being labelled as alt-right or sympathetic to the alt-right, despite all three having vehement criticisms of the movement. You may strongly dislike all three individuals, but to call them alt-right is an objective falsehood. There is even heavy debate amongst the alt-right themselves as to what the movement actually is, and basic questions about its goals and ideals have been raised. This therefore makes it difficult to quantify whether or not someone is or is not alt-right due to the uncertainty of the actual term, thus making the term close to useless outside of general platitudes. Fender’s post attempts to clarify that it “has been determined that the Alt-Right majorly consists of white supremacists, neo-fascists, and other fringe hate groups”, but many users who have been banned from FurAffinity in the recent ban-wave do not remotely sympathise, let alone identify with actual fringe groups, which leads me onto my second point. AltFurry is NOT an alt-right movement and it’s not remotely close to being one. In fact, the term “AltFurry” is a tongue-in-cheek reference to accusations levelled by a particularly radical group of left-wing activists, who seek solely to divide the furry fandom by political lines. As mentioned earlier, the term “alt-right” is often misused and applied to brand those who are remotely critical of a lynch mob mentality, regardless of their actual political beliefs. Rather than perpetually denying the label though, the AltFurry take a more sardonic approach, facetiously flirting with the label to further aggravate the political extremists (this is best evidenced by the satirical use of “This is why we need #AltFurry” tweets), much in the same way many have begun to ironically revere the Star Wars prequels in an effort to partially throw shade at fans of the new trilogy of Star Wars films. The truth is that AltFurry represents a movement that is opposed to all political extremism within the furry fandom, (extremism in this context being the willingness to commit actions against a group of people irrespective of their rights, such as censorship) and contains within it a myriad of political views across the political spectrum. However, due to the omnipresent danger of far-left extremists who wish to not only politicise the fandom but seek to physically harm those who do not agree with their views, as well as their considerable influence compared to any other extremist political grouping within the fandom, it is necessary to cater specifically towards dealing with the problems presented by this particular extremist group for the time being. 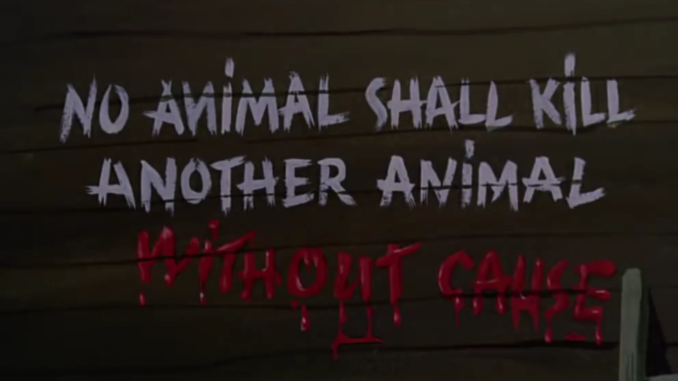 AltFurry exists as a means to undermine those who would seek out to derail the fandom currently, and is open and tolerant of all who wish to minimise the ever-rising bigotry towards particular groups of individuals, and to prevent any politically motivated influence being asserted onto the community. On the topic of influence, the most important point of all is the unequivocal truth that the changes to the FurAffinity code of conduct were products of political extremism themselves, and are currently facing little worthwhile resistance outside of AltFurry. Despite Anti-Fa being classified as a domestic terrorist organisation by both the US Department of Homeland Security and the Federal Bureau of Investigation, FurAffinity does not recognise this distinction, and claims that left-wing extremists will only be banned if they threaten or incite violence, whilst holding a double standard towards those who supposedly express views parallel to the alt-right, despite the fact that many liberals and centrists have been caught in the recent ban-wave. This decision was clearly not made, or at least, influenced by a neutral arbiter; it was specifically driven by a political agenda. I do not believe Dragoneer, FA’s head admin, was entirely to blame for this decision, despite ultimately making the decision to enforce the new rule, and he did specify that the action he took were not to do with politics, but I do believe he was heavily influenced by social pressure from an increasingly powerful and ravenous group of political extremists within the fandom who are happy to silence any dissenting opinions to their own, whether they are legitimately alt-right or not. This would be a horrifying monopoly on opinions and language in any political community, but the fact that this is being used to propagate a malevolent political sub-faction within a non-political community should deeply disturb you. Even those who are apolitical who use the wrong language, or do not agree with the tyrannical aims of the far-left furs are at peril from this, and this risks fracturing the furry community more so than any drama before it has faced. It is ironic that Dragoneer says that fictional terrorist groups, such as Cobra from G.I Joe, are exempt from this rule, when AltFurry is itself a fictional terrorist group, manufactured by individuals who seek to divide and purify the furry community on political grounds. By prohibiting only certain extremist political movements, FurAffinity is creating an environment where the other extremist political movements may thrive, as a vacuum creates an opportunity for intentions, good or bad, to manifest. The double standards in permitting left-wing extremism, but not right-wing extremism, despite that in the community the former is far more influential and powerful, will have disastrous consequences unless it is stopped. And this is why we truly need AltFurry. We need AltFurry to fight for a furry fandom tolerant and welcoming to all, regardless of race, gender, sexuality, age, disability or any other differences. We need AltFurry to prevent radical political groups from gaining traction within the fandom who wish to submit an apolitical group of like-minded people to their subjective political opinions. We need AltFurry to capitalise on the vacuum created by the extremists for good. And most importantly of all, we need AltFurry to ensure that the well-being of others are never undermined, for if we stop valuing some human life, it is invariable that the value of all human life will be at significant risk. And to the radicals I’ve been describing who may be reading this article, you are welcome to hold your political views. You are welcome to express them. But don’t you dare enforce your tyrannical standards upon a wide community of people who celebrate diversity and welcome anyone who wishes to participate in the fandom. You are more fascist and totalitarian than the people you claim to be against, and actually have the power to exercise that, unlike us. But the rest of the furry fandom, once they see you for what you are, will not stand for it, and will not allow for your belligerence. To quote Martin Luther King Jr: “Nothing in all the world is more dangerous than sincere ignorance and conscientious stupidity.” And a change of attitude is needed to combat your discriminatory beliefs, one that does not pretend to support forgiveness and tolerance, but actually practices it. I’m taking this article as genuine, because that’s the only way we can possibly move forward out of this mess, by extending a little bit of good faith to one another, and hoping it snowballs. I love satire. But that may be a foundational error. Right now tensions are high, and paranoia is raging. While there are bad faith actors on both sides, there are also people in the middle who are authentically afraid of boogie-men. It’s like trying to calm down a cornered, wounded, snarling animal. I like humor, rough jokes, banter- but the current situation is precarious. People are already having extreme difficulty perceiving others with accuracy, and satire is an additional layer that can further obscure. Plus it makes it easier for those who seek to mislabel you. At present, I would advise slow, cautious movements and deliberate, true words as we try to calm the fearful. I think this article is a great first step. We have a satire tag for satire. This isn’t that. This is a guest piece by FoxFromTheWest, and folks who know him will know it’s heartfelt. No header, no footer, no interspersed rebuttals. Just Fox’s genuine opinion. I’m honored to host this, as Fox doesn’t participate publicly in politics very much anymore. He got out right in time, if you ask me, and diving back in right now took some stones. Thanks for the clarification. I think my comment was unclear, I didn’t mean to imply that this article was itself satire. It came across to me as well spoken and serious. I’m thinking more in general terms, that when reaching out to the misinformed, it’s a touch-and-go effort. I’m mainly speaking from my recent article and the subsequent experiences, where even very simple statements are virtually impossible to convey to those within the mob. I managed to get through and reason with a few of them, but only by being as serious and simple (and humorless) as possible. And yeah, anyone jumping into this conversation now is undeniably bold! It’s a relief having more common-sense voices speaking up, and I hope his example will inspire more to risk speaking their mind. Thanks guys for the solid article.